The Westin Chosun Seoul, Monday, Oct. 9, 2006 — This autumn, nourish your body and soul at Ho Kyung Jeon with fresh and flavorful King Prawns from the pristine ocean waters. Low in fat and calories, yet rich in calcium and vitamins, King Prawns are favored for their nutritional values as much as for their delicious taste. And also highly versatile, this popular crustacean makes an appealing companion to almost any type of dish. Come and savor the firm white meat and sweet, succulent flavors of high-quality King Prawns in a wide array of delectable cuisines. 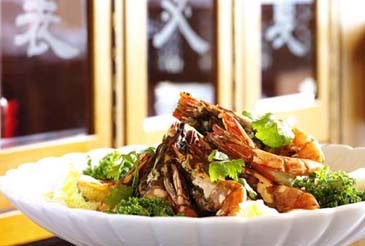 Marvelously prepared sets with Steamed King Prawn with Garlic Sauce, Sauteed Shrimp and Chinese Sausage with Bell Pepper, Steamed Whole Shark's Fin with Shrimp, and more are a feast for the eyes as well as for the palate. For one month only, experience this bountiful late autumn fare at Ho Kyung Jeon!